My favorite genre of music is indie rock. I love everything about it. Now that I am self-publishing my book Faith Adventures on Amazon Kindle Direct Publishing, I am trying to look at my act of self-publishing as indie. Indie is short for independent, usually meaning released by small or self-started label instead of a big record label, such as Capital or Sony. Independent also can also mean outside of the mainstream, and it has a connotation of being hip or obscure. My favorite indie music is diverse and borrows from different genres of music, like jazz, folk, and world music. I also enjoy music that is intellectual, uses big words or complex stories in the lyrics. One of my favorite artist, Andrew Bird, even makes up his own words in his music. These types of songs don’t hit the Top 40. The world we live in today makes it easy for artist to even release music without a label. Studios and producers have been replaced with a laptops. This opens up the possibility of so much new music. In the same way, Amazon has opened a new format to bring more writing to readers through self-publishing with Kindle Direct Publishing. Hopefully a bigger pool is better; more diverse and more ideas can always be defined as better. I’m letting go of the bad stereotypes of self-publishing, and I’m picking up all of my favorite stereotypes of indie. I am releasing my indie book on Tuesday, December 1st. I hope you will consider buying it and reading it. I hope it goes against the mainstream, is intellectual, and hip. This step of putting my work out there on my own is a baby step in my big goal. This big goal is something I feel God pushing me to do, and that is to get a book published about my story of losing my brother to suicide. It is a difficult story to tell, but I believe God has given me some hope to offer others who have lost a loved one to suicide and incite to those who haven’t. Right now, my small goal is to continue to get better at writing, so when I finally get my opportunity to tell that story, I will be ready. This book I wrote to release independently is a book of essays and scripture studies centered around faith. I am actually pretty happy with this indie book I have crafted. I hope you will read it and be happy with it, too. Are you subscribed to my blog? 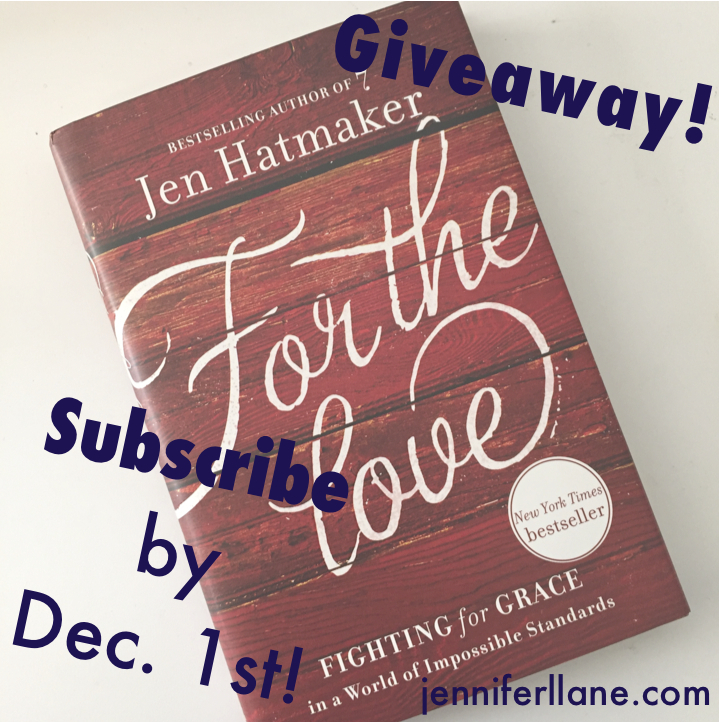 If not, subscribe anytime between today, November 13th and December 1st to be entered to win a copy of Jen Hatmaker's new New York Times Bestseller For the Love. I will be drawing a winner live on Periscope on Tuesday, December 1st. Just enter you're email in the subscribe box below to enter. I love music! I like to share a song with each blog post. Here's a good one.